SAITAMA, Japan (AP) — Olympic champion Alina Zagitova produced a season-best score Wednesday to take the lead after the short program on the opening day of the world figure skating championships. Zagitova opened her routine at Saitama Super Arena with a triple-lutz, triple-loop combination and added a double axel and a triple flip for 82.08 points. Japanese national champion Kaori Sakamoto was second with 76.86 points, while Elizabet Tursynbaeva of Kazakstan was third with 75.96. Sakamoto also recorded a personal-best with a routine that featured a triple-flip, triple-toeloop combination, a double axel and triple loop. “I was able to execute everything as I did in practice and will aim to do that again in the free skate,” Sakamoto said. Tursynbaeva, the Four Continents silver medalist, was the biggest surprise of the opening day with an impressive short program that included a triple lutz, a double axel and a triple-salchow, triple-toeloop combination. Two-time world champion and Olympic silver medalist Evgenia Medvedeva of Russia was fourth with 74.23. 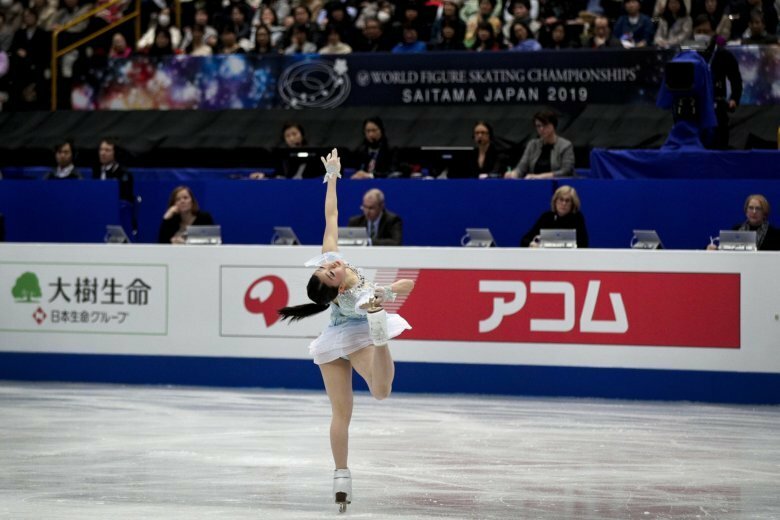 Japanese skater Rika Kihira entered the competition with high expectations after beating Zagitova at the Grand Prix Finals but wasn’t able to execute her triple axel and finished in seventh with 70.90 points. Lim Eun-soo of South Korea was fifth, followed by Mariah Bell of the United States. Russian skaters Evgenia Tarasova and Vladimir Morozov took the lead in the pairs short program with a season-best score of 81.21 points. Wenjing Sui and Cong Han of China were second, followed by teammates Cheng Peng and Yang Jin. The men’s short program is on Thursday. Two-time Olympic champion Yuzuru Hanyu has recovered from an ankle injury and will be favored on home ice.